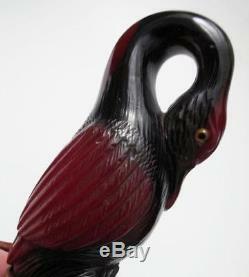 CARVED CHERRY AMBER BAKELITE BIRD PARASOL UMBRELLA WALKING STICK CANE HANDLE. 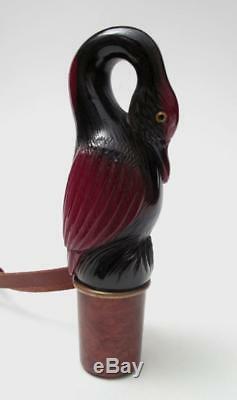 EXQUISITE VINTAGE CARVED RICH CHERRY AMBER BAKELITE UMBRELLA / CANE HANDLE. 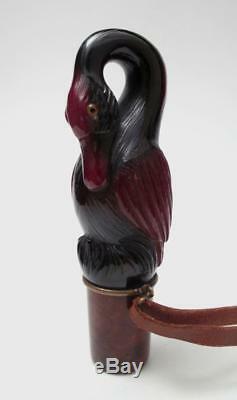 Presenting a truly spectacular carved cherry amber bakelite umbrella / parasol or walking stick cane handle. 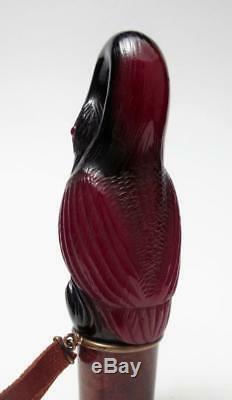 This exquisite cherry amber bakelite piece has been expertly hand carved into the shape of a bird. The form and detail is stunning. 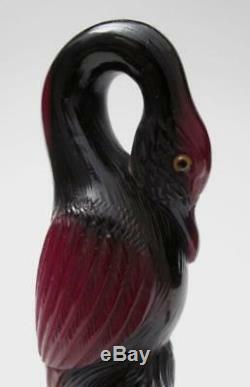 This exceptional example is the finest piece we have had the pleasure to present and far exceeds any documented examples of carved bakelite handles we have seen. The quality of carving, the finish, and the stunning richness of the colour of the bakelite all indicate an exceptionally high quality piece which is an absolute delight to the sight and touch. Rich darker tones are apparent throughout the design and add a stunning depth to the three dimensional design. 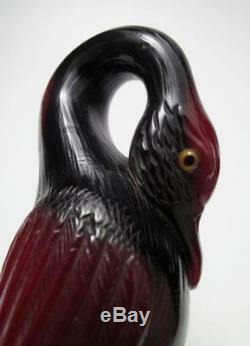 The expertly carved birds head is inset with realistic glass eyes which wonderfully complete this masterfully handcrafted example. The bakelite handle is set atop a most exquisitely grained timber. No expense has been spared... The masterful craftsmanship, quality materials and magnificent design combine to create one of the most exquisite examples you could possibly find. The original leather strap is attached to a central bronze band. 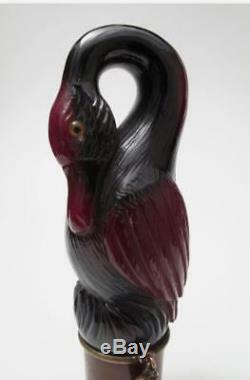 The images will far better indicate the sheer beauty of this exceptional piece. 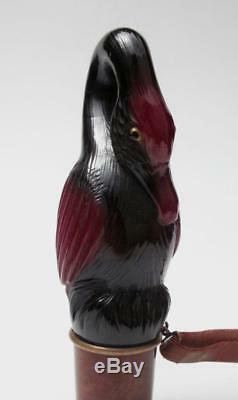 This exquisite example is presented in pristine condition. 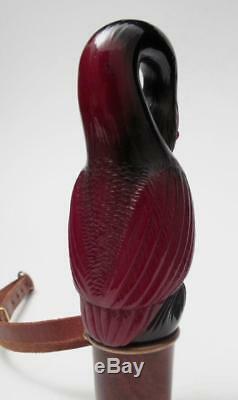 The bakelite has a magnificent richness of colour and stunning lustre. The wood mount is pristine. Exceptionally minor wear to the leather strap mentioned for complete accuracy. This exceptional example, the likes of which are undocumented, has been very well cared for and presents spectacularly. The handle measures approx 125mms in height and 40mms in width. 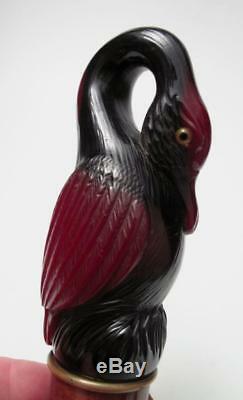 This handle tests positive to being bakelite. While we have attempted to capture the true essence and beauty of this magnificent handle, one can only fully experience the true splendor, fine detail and amazing intensity and richness of colour in real life!! 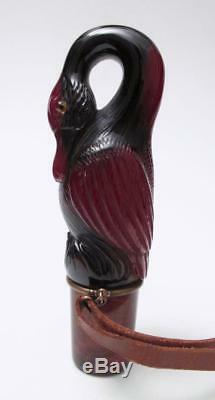 This exquisite cherry amber bakelite handle would make an outstanding addition to any vintage bakelite collection. Rest assured, all items are professionally packaged to the highest of standards! International buyers are most welcome. Sorry, no personal cheques accepted. All items are professionally packaged using quality materials. We individually hand select quality vintage, antique, well designed and hand crafted pre-loved items, and proudly offer our finds for sale. We aim to describe and visually represent our items as accurately as possible. Auctiva offers Free Image Hosting and Editing. 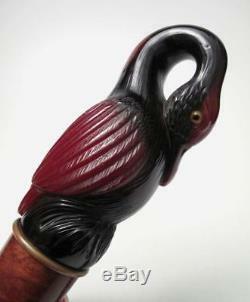 The item "CARVED CHERRY AMBER BAKELITE BIRD PARASOL UMBRELLA WALKING STICK CANE HANDLE" is in sale since Friday, August 24, 2018. This item is in the category "Jewellery & Watches\Vintage, Antique Jewellery". The seller is "threetreefrogs" and is located in melbourne. This item can be shipped worldwide.